This sienna is a natural orange-brown earth pigment imported from Italy. 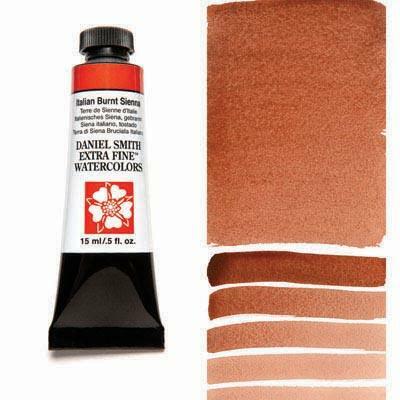 Use this with the same method and purpose as plain Burnt Sienna. Many artists prefer Italian Burnt Sienna over others, perhaps the subtle quality of Italian Burnt Sienna more closely matches the brown and earth tones of our Pacific Northwest. Balance a super-opaque such as Indian Red or Cadmium against super transparent Quinacridone Gold or Burnt Orange, then incorporate Italian Burnt Sienna to unify fall landscapes or close-up leaf studies, as well as to render weathered slate and old brick.